An ideal indoor mat for use in indoor entryways, the Waterhog Masterpiece Select features an innovative parquet design engineered to scrape off dirt, debris, water and snow from footwear from all traffic angles. A combination of beauty and durability, the Masterpiece is Certified by The National Floor Safety Institute. I am ordering mats in the following sizes: 2x3, 3x4, 3x5. How do I indicate that I would like smooth backing? With an attractive parquet-pattern design, the Waterhog Masterpiece Select indoor mat is as functional as it is fashionable. The innovative parquet look is designed to scrape off dirt, debris, water and snow from footwear from all traffic angles, brought to you by Koffler Sales. These are great, long=lasting Mats. Thank you for your review. We very much appreciate your feedback. If there's ever anything we can do to assist you, please don't hesitate to give us a call. The WaterHog Mats have proven to be long lasting and effective for our Apartment Building. Ihave purchased these in several colors and sizes and am very happy with the results. They are attractive and cut down on noise. Koffler gave delivery tracking information and all went well. Thank you. Thank you very much for your review. 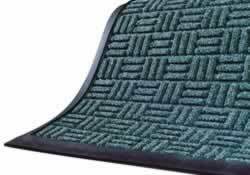 We very pleased the Waterdog mats and our service delivery gave you the perfect results. Just received the product and I�m very happy so far! Nice design and function. this item is a forever durability and will passed down to the next generation. no dirt or water getting pass this!!!!! Tapered edge, anti-fatigue drainage mat. Provides comfort for safe work environment.